There is nothing better than enjoying a glass of wine after a long day at work. Wine is considered the drink of kings. It has always been present at regal feasts and banquets. It is also quite healthy to have a glass of wine occasionally. Some even take this passion for wine to a whole new level. People collect bottles of wine and store them in a cellar or even a small wine cooler. In fact, for someone that does not have a cellar, a wine cooler would be the best option. Actually, wine coolers can be used for other drinks as well. It is quite common to see someone have a wine cooler in their living room, filled with all sorts of drinks, especially for guests. There are plenty of reasons to get a wine cooler. Wine coolers are basically small refrigerators but because of their design, they do not reach temperatures below freezing point. This is due to the fact that they have a see-through window that is thinner than a refrigerator door that does not have an insulating effect. The compressor is also adjusted so that the temperature does not go too low. Also, they tend to have shelves that allow only for bottles to be stored inside. They look almost like bottle racks. Today we will go through some of the most popular wine coolers. We picked both large and small wine coolers. Some are cheap while others are a bit more expensive. 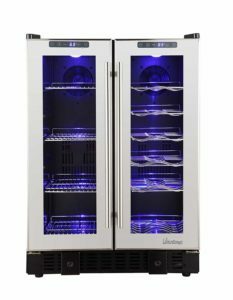 Without delaying it any further, here are the top 10 best built-in wine coolers in 2019. Which Wine Cooler To Pick? 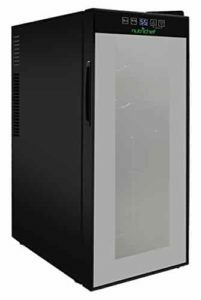 NewAir AWR-460DB dual zone wine cooler is a premium model that might seem a bit expensive. It has a decent capacity of 46 bottles but what is most interesting about it is the cooler works with two zones that maintain different temperatures. The controls for each zone are placed on the sides of a large LCD screen that shows the temperatures. The cooler itself is made of a stainless steel housing and a brushed finish. It also has 5 wood shelves that can be pulled out like a drawer. 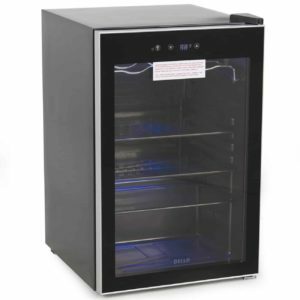 NewAir ABR-960 is presented as a general beverage cooler but it works just like a regular wine cooler. The main difference is that it is a bit narrower. The compressor used is quite powerful and can go to temperatures as low as 36 degrees. According to the manufacturers, the cooler can hold about 96 cans or about 24 bottles of wine. It has a large see-through windows and space is separated into 5 shelves. The glass door is reversible while the interior is illuminated by a blue LED. 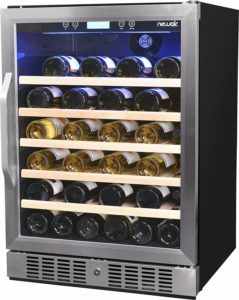 DELLA 048-GM-48198 wine cooler is a great pick for the ones that are passionate about their collection of bottles. It is an inexpensive cooler with a decent ability to maintain a low temperature of 40 degrees. 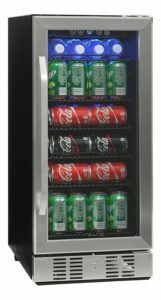 The cooler can hold a maximum of 24 bottles, has adjustable trays and reversible doors. Temperature control is done used two touch sensitive buttons on the inside while the thick glass door offers visibility and good insulation. Nutrichef wine cooler is a great pick for the ones that do not have a lot of money to spend. It is a small cooler that can store a maximum number of 12 bottles. The model has a simple see through window on the door. One major plus is the fact that the cooler is very quiet. It uses a silent compressor. Also, it is quite lightweight and easy to move around. For better cooling efficiency, the cooler uses a circulation fan and a good insulating door. If there is one feature that the vast majority of wine coolers have, is their reversible door design. This feature is not present in the Nutrichef wine cooler. This can be a bit restrictive when it comes to finding a spot for the cooler. Still, it does not make it a bad product. NewAir makes a lot of different wine coolers. The AWR-520SB is one of the larger models on our list. It can hold up to 52 bottles which means that it not exactly suitable for domestic use. It was designed to be used mostly in restaurants and bars. The compressor can maintain temperatures as low as 40 degrees Fahrenheit while the large, clear glass door makes it easy to look at the interior. The door on the cooler is reversible while the temperature is very easy to adjust. As for design, the cooler has a simple brushed stainless steel front and black coating on the sides. The wine cooler is quite expensive and not everyone is willing to spend this much on a wine cooler. It will be cheaper to get two smaller wine cooler but they will take up more floor space. For a small business, it will prove to be a great pick but for use at home, it might just not be worth it. 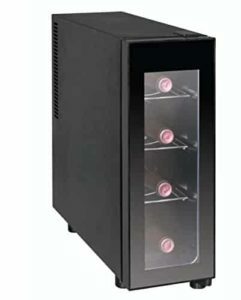 Vinotemp mirrored wine and beverage cooler is a great pick for the ones that need reliable storage for their beverage for a small or large venue. It is a mirrored cooler with two large stainless steel doors and dual-zone cooling. The left zone can go as low as 36 degrees while the right is more suitable for wine as it can only drop to 40 degrees. In terms of capacity, the cooler can hold 52 cans of beverage and 19 bottles of wine. Each zone has a dedicated temperature control and chromed shelves. The cooler works great especially due to its powerful compressor but it does have a problem. Compared to other coolers, the unit is quite loud. It is most noticeable when the compressor starts or stops as it gives a powerful knock as if something is hitting the cooler. For such an expensive cooler, it is a bit unexpected. 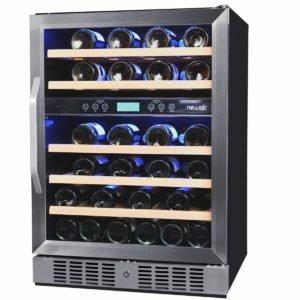 Igloo FRW1201 is one of the best picks for the ones that are looking for a wine cooler that can be used at home. When it comes to a simple home user, size is important. The cooler is quite compact but it can still hold 12 regular bottles of wine. It has a simple glass door and can have its height adjustable. To ensure that the temperature inside is constant, the door uses a double glass layer. Also, the small compressor used for the cooler is extremely silent. Usually, wine is better preserved at around 40 to 55 degrees. That is cool enough for wine but not for other types of beverages. The cooler can only be used for wine. It runs silently and can maintain the temperature without any problems. IGLOO is a brand with which most should be familiar. The FRW041 is a simple and cheap wine cooler. It was made to be very compact but it can only hold 4 bottles of wine. It is available in other sizes as well but the smallest one is the most convenient one. The cooling temperature can go as low as 45 degrees according to the manufacturers and can be adjusted using the simple controls on the inside. Build quality is fairly decent but the biggest selling point is the low price tag. The IGLOO FRW041 is a great pick for the ones that want to save space. However, the model has some issues with quality control in the sense that some users got a cooler that could go as low as 45 degrees while others could barely get it below 55. 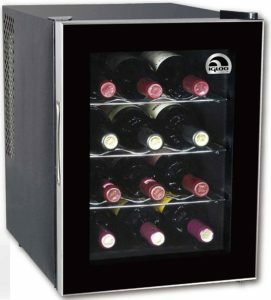 NewAir AW-281E wine cooler is an excellent pick for the ones that are looking to get the most out of their money. 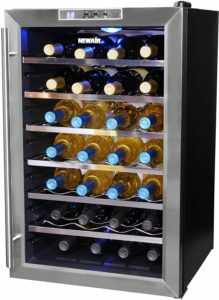 It is a compact but spacious cooler that can hold 28 wine bottles and does not cost all that much. The model supports temperatures as low as 54 degrees and can go as high as 66. 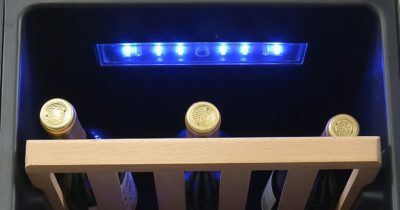 The interior of the cooler is illuminated with a blue LED light while the large door makes it easy to look inside. In terms of temperature control, the panel is placed on the door which makes it much more convenient than the coolers that have it inside. The issue with the NewAir is when trying to store larger bottles of wine. Because the shelves are too close to each other, the cooler will only be able to hold regular wine bottles. If they are just a bit bigger, they simply will not fit. NewAir AWR-290DB is one of the best options for every wine lover. Despite its compact size, the cooler can hold up to 29 wine bottles and even has a shelve for larger bottles. What is interesting about it is the dual zone design. The top and the bottom side of the cooler can have different temperatures. For the door, the manufacturers used a special UV coating and the double glass layer offers good thermal insulation. For such a compact and small cooler, the model is a bit expensive. On the upside, the dual zone feature is more popular on very large models. This cooler was made to be compact and someone could easily find a place for it inside a small kitchen or even a living room. Cooling temperature: Cooling temperature can vary from one model to another. 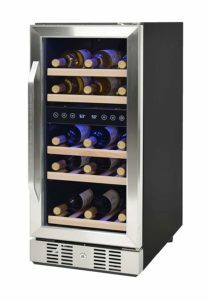 A good wine cooler should be able to reach temperatures no lower than 40 degrees. Temperatures lower than that can affect the quality of the wine. Capacity: The capacity of the cooler is important. There are models that can hold as few as 4 wine bottles but there are also coolers that can hold 80 or more. Usually, the bigger they are, the more space and power they need. Pricing: Sometimes, size is not the only selection criteria. Pricing is an important factor as not everyone is willing to spend thousands of dollars on a wine cooler. Also, it might be worth it to get a smaller but more expensive model rather than a big and cheap one. It sounds like common sense but a lot of people choose to ignore this rule.